The human resource department of an organization is a very important and critical function of the company. It deals with all the issues and problems related to the human capital of the company. This is, in essence, the most important resource in the business and is the largest contributor towards success and profit maximization. Some of the key responsibilities of the human resource department of the company are recruitment and hiring, training, job description, job development and performance appraisal. The last activity is a very crucial element of the HR policy of the company. The methods and techniques of performance appraisal dictate how the employees will get tested and rewarded for their efforts and hard work. For this purpose, many companies have devised the performance appraisal forms that are targeted towards specific questions that help procure the information that is needed to rank the individual performance. What is an own appraisal form? 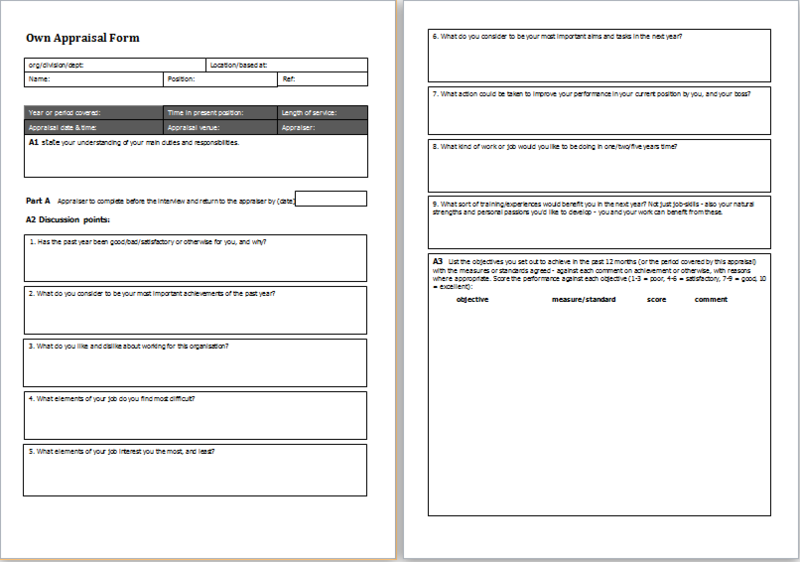 The own appraisal form is used for a similar purpose. It reflects the job description of the person and has detailed information about the person’s current appointment and responsibilities. The form describes the time period for which it is valid, the goals of the employee and whether not the employee was able to achieve the said goals and targets. It gives task by task detail of the objectives and how well the employee was able to complete those tasks fully or partially. So own appraisal form helps the HR department gauge the employee performance through standardized criteria and rules.